It’s been a funny old week, with Mercury Retrograde in Sagittarius (my sign), I’ve been feeling a little off kilter. Just can’t seem to put my finger on what exactly is wrong, but I just don’t feel my normal self. I also think it’s just coming in to that crazy time of the year where the diary is getting fuller by the minute with social occasions and work commitments, and it all gets a little overwhelming. Passion Planner are no longer making the compact size planner and I don’t want to go any bigger. I’m not certain that I really used my Passion Planner to its full potential in 2018 so I’m possibly wasting my money on all the extra features. I felt like I got too caught up in planning this year, so much so that I was focusing way too much on to-do lists but not on the actual doing. Don’t get me wrong, I still LOVE Passion Planner, and I may even buy one again - but I am going to try something different this year. I went and checked out some simple planners at Officeworks, and I think I’ve decided on one from there. The same day I went to Officeworks, I received an email from another blogger I follow, Xandra Robinson Burns, of HeroineTraining.com - Turns out Xandra has also decided to move away from Passion Planner and is instead DIYing her planner from now on. I really enjoyed this simple and practical video that Xandra made, explaining her new planning process (it’s actually like she read my mind!). She also talks about how she still loves Passion Planner and how using a Passion Planner set her up with a system of planning that works for her. In the mean time, I’m also experimenting with using a bullet journal and drawing up my own weekly spreads. I’m doing this as a creative outlet and a way to be mindful. I write out my weekly schedule in there but also reflect on the day’s events each night before bed. 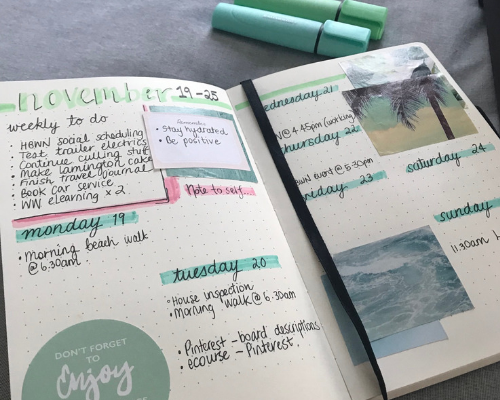 If you search ‘Bullet Journal’ on Pinterest you will find so many beautiful photos of weekly spreads that ‘BUJO’ devotees around the world have painstakingly created. Mine is not like that. I just do a simple layout and try not to get too hung up on it being too fussy. I don’t need it to be insta-worthy, as it’s just for me. I’m also really loving the new Rufus Du Sol song “Treat You Better” - it’s on high rotation this week! Besides that, I listened to a lot of Above and Beyond (acoustic) and Diana Krall (Live in Paris) this weekend as I was on a road trip to Newcastle and back. You can find me on Spotify and creep my playlists here. At the moment I’m reading “Secrets About Life Every Woman Should Know” by Barbara De Angelis, Ph.D. Basically this book is all about empowering you to get your sh*t together and realising that you have everything you need within you to actually do it. It’s taken me a while to get through it but I have enjoyed it and feel like a lot of it is starting to sink in. It always takes me a while to digest anything self-help-y, whereas a good novel will take me less than a day to plow through. You can read a synopsis of the book here. Dear God, let it be Annabel!). You can check out the details here. I’m totally digging my new Sussan brunch coat that I picked up from a thrift shop for just $2. It’s sage green with a pink trim and is adorned with white flowers.. So adorable - I keep trying to find excuses to wear it. Last Sunday I showered and put on my PJ’s at 2pm, just so I could wear my cute brunch coat! 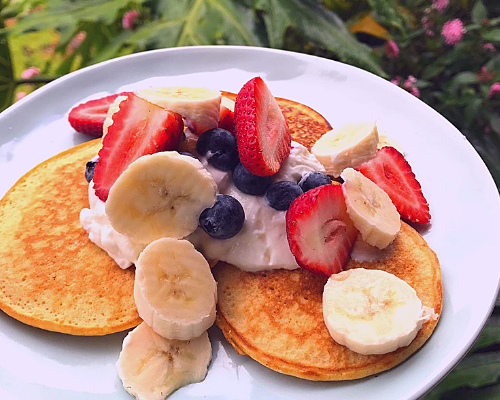 I discovered that you can make Gluten Free pancakes using Chick Peas and they are delightful! I have been guzzling SO much herbal tea - basically as a means of increasing my water intake, but also to help me chill out. At the moment I am constantly sipping on Relax tea that I bought online from an Aussie company called Tea Leaves. They describe Relax as “A flowery, minty, calming herb blend with no caffeine”. It’s so good and I’ve been drinking it all day, every day (in fact I’ve got a cup on the go right now as I’m writing this). I’ve been making a really conscious effort to de-clutter my life, starting with my bedroom. While I was overseas recently I realised that I am able to live my life with so much less stuff than what I had thought. And I have SO MUCH stuff and it is starting to make me feel really claustrophobic. I’ve decided to do a massive clean out and get rid of all the stuff that I don’t use (spoiler: that’s a lot of stuff). I can’t wait to get it all out of my house and have a garage sale! I’m hoping that by reducing the amount of clutter in my life, it will free up more brain space and make me feel lighter. Know what I mean? Hope you had a loverly, relaxed and restful weekend.